Anyone who loves baseball and history will love this story. I found it on NPR reported by Nina Totenberg who covers the Supreme Court. It is about a combination moot court and historic re-enactment. The case is Curt Flood v. Bowie Kuhn from 1972. Law school often do this kind of re-enactment, but this one was sponsored by the Supreme Court Historical Society. Justice Sotomayor presided from the seat of the Chief Justice. For those who don’t remember, the case was brought by St. Louis Cardinals great Curt Flood, who challenged baseball’s reserve clause — the provision that allowed teams to virtually own players, set salaries and conduct trades, with the players for all practical purposes never able to negotiate freely with other teams. That meant that at the time Flood brought his challenge in 1970, he was earning what was then considered a top salary of $90,000. This, for a player who had signed with the Cards at age 18, with no agent or lawyer, and who in six of the next 12 seasons batted .300 and won seven Gold Glove awards. So, when he was traded to the Philadelphia Phillies, a definitely lesser team at the time, he refused to go, and could not play for any team. He wrote to the then-baseball commissioner, Bowie Kuhn, protesting that he was “not a piece of property to be bought and sold.” Kuhn denied his request for free agency — a concept unrecognized by baseball back then — and Flood sued, seeking to block the perpetual use of the reserve clause. Flood lost, but baseball changed forever as the free agency system was put into place anyway. In 1994, however, nearly two decades after the Flood decision and the ensuing changes in baseball, the owners sought to effectively nullify the free agency system, and the baseball players struck, wiping out the playoffs and the World Series. The National Labor Relations Board went to court, contending that the owners were negotiating in bad faith, and the case came before a young federal district court judge named Sonia Sotomayor. The arguments in the re-enactment veered between history and current day baseball. Representing Flood at the re-enactment was Stanford Law professor Pamela Karlan, a frequent Supreme Court advocate, and ironically, a former Blackmun law clerk. And representing Major League Baseball was another frequent Supreme Court advocate, Roy Englert. Karlan opened, noting that the Supreme Court’s 1922 and 1953 decisions upholding baseball’s antitrust exemption were outliers and that the court had not permitted such an exemption for any other professional sport. Sotomayor asked why the court should “break with tradition,” thus depriving the owners of their “reliance” on previous decisions. Karlan shot back that if the court were to side with the owners for a third time, it would amount to something done in baseball only once before — three errors on a single play. 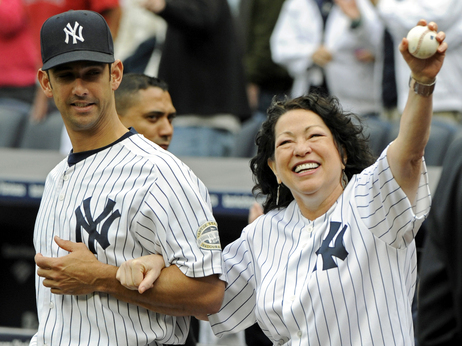 Sotomayor, with a straight face, opined that the court could apply another baseball rule: three strikes and you’re out. The next exchange con free agency and salaries management to get in a dig at Sotomayor’s favorite Yankees. Sotomayor asked what would happen if the court were to take away the antitrust exemption. Wouldn’t the players move around so much that fans would have no team loyalty? No, rejoined Karlan, the owners would just have to pay the players what they are worth in order to hold on to them, and instead of year-to-year contracts that leave players with no leverage, the owners would have to negotiate longer-term contracts. Sotomayor, in mock horror, said that if the antitrust exemption were abolished and owners could no longer collude to set player salaries at will, the Yankees might have to pay Reggie Jackson $1 million a year! Worse, replied Karlan, would be if the Yanks paid Alex Rodriguez a quarter of a billion dollars not to play. “I can’t imagine such a thing!” answered a shocked Sotomayor. Next at bat were the owners. Next up to the lectern was Roy Englert, representing the baseball commissioner and owners. He noted that some 50 bills had been introduced in Congress over the years to eliminate the antitrust exemption, and none had passed. The court, he said, should leave the question to Congress. But Sotomayor asked, “Where are the rights of the players?” Quoting Curt Flood, she said that the baseball system was a form of “involuntary servitude” that does not exist in any other industry. Englert replied that “these young men are making on average $28,000 … as much as Supreme Court justices.” Moreover, unlike other sports, he observed, baseball puts enormous investment into training players in the minor leagues. The case does involve some serious legal questions, some raised by the decision written by Justice Blackmun. It appears that Blackmun was reluctant to overturn the prior decisions, but wrote his opinion in such a was that everyone understood that baseball did in fact fall under that anti-trust laws and does engage in interstate commerce. ‘There are Supreme Court decisions that are wrong,” she said. The court’s 1896 decision upholding segregation was wrong, and the Supreme Court was right to reverse it in 1954. But sometimes, she said, the question is not whether the decision was wrong, but whether this is the right time to overrule it. 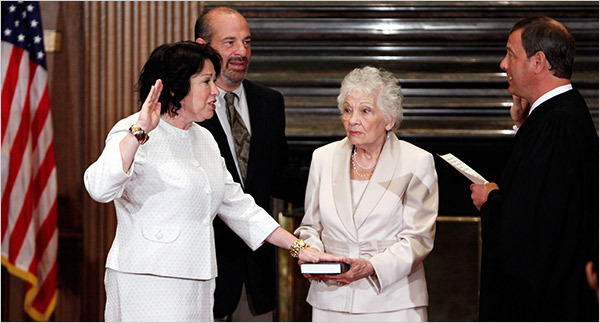 Sonia Sotomayor is now officially Justice Sotomayor. She took the oath administered by Chief Justice John Robert a few minutes ago. On Thursday afternoon when the Senate voted to confirm her, the newest Senator, Al Franken the former comedian from Minnesota, was presiding and announced the vote. Is this a great country or what? Anita Hill has a very interesting Op-Ed in today’s Boston Globe discussing the role of what she calls “educational democracy” played in Justice Sotomayor’s elevation to the Supreme Court. Indeed, Wilson would have needed a high-definition crystal ball to foresee Sotomayor’s “incredible journey’’ to become an African-American president’s nominee to the Supreme Court. Yet, as a critical chapter in our country’s pursuit of educational equality, her story of hard work and high achievement is an extension of Wilson’s idea. She represents the positive change that can occur when social institutions – law and education in particular – shed their roles as tools for exclusion and open their doors to those previously barred. It took nearly 220 years for the first Latina justice to be appointed to the Supreme Court, but, in a country constitutionally committed to equal opportunity, it was inevitable. It was under President Wilson that women gained the right to vote – a reward for suspending demonstrations for suffrage during World War I. And I’ve always thought that Edith Wilson had influence here also even though I don’t believe that any historical facts have ever surfaced to proved this. Sotomayor is poised to prove that the social experiment of the 1970s built on the idea of educational democracy has, thus far, worked. For its full realization, President Obama must correct the documented shortcomings of public schools that weigh most heavily on poor and minority community schools. We can’t be satisfied with one Sonia Sotomayor when we have the potential for so many more. For now, with her confirmation as the first Latina and third woman on the Supreme Court, Obama has reminded us of what egalitarian ideals and the will to pursue them can accomplish. I think Hill is right. Educational democracy leads to a critical mass of women, African Americans, or other ethnic minorities ready to take on jobs and challenges that have not been open to them in the past. This leads to a cascade of changes in our society such as the election of the first African American President. I think it is the loss of this exclusivity that has the white Republican men on the Senate Judiciary Committee so frightened. Perhaps they have seen all along where affirmative action or educational democracy was going to lead and why they have been so opposed to change. But that is probably giving them too much credit and they are just frightened of change that puts them in a position where they are no longer superior. One where they have to share power and priviledge. Congratuations, Justice Sotomayor! And may the President’s next appointment be someone as wise as you. Perhaps a wise Asian American man or woman or a wise African American woman. Mary Frances Berry, anyone? Over the weekend two very interesting pieces appeared. One was Frank Rich’s column in the New York Times, the other Melissa Harris Lacewell in the Nation. Both approach the subject of Senatorial attitude toward a Latina woman. One writer is a middle aged white male and former New York Times theater critic, the other a young, African American professor at Princeton. Yet the Sotomayor show was still rich in historical significance. Someday we may regard it as we do those final, frozen tableaus of Pompeii. It offered a vivid snapshot of what Washington looked like when clueless ancien-régime conservatives were feebly clinging to their last levers of power, blissfully oblivious to the new America that was crashing down on their heads and reducing their antics to a sideshow as ridiculous as it was obsolescent. The hearings were pure “Alice in Wonderland.” Reality was turned upside down. Southern senators who relate every question to race, ethnicity and gender just assumed that their unreconstructed obsessions are America’s and that the country would find them riveting. Instead the country yawned. The Sotomayor questioners also assumed a Hispanic woman, simply for being a Hispanic woman, could be portrayed as The Other and patronized like a greenhorn unfamiliar with How We Do Things Around Here. The senators seemed to have no idea they were describing themselves when they tried to caricature Sotomayor as an overemotional, biased ideologue. They are both describing what Harris-Lacewell calls “the politics of public humiliation.” The practice of this kind of politics in the year 2009 says more about the Republicans than about Sotomayor – or the current status of women of color. Rich ties the Republicans to the Class of 1994, the Class of the Contract with America, the Newt Gingrich class. That the class of ’94 failed on almost every count is a matter of history, no matter how hard it has retroactively tried to blame its disastrous record on George W. Bush. Its incompetence may even have been greater than its world-class hypocrisy. Its only memorable achievements were to shut down the government in a fit of pique and to impeach Bill Clinton in a tsunami of moral outrage. …Today the G.O.P.’s token black is its party chairman, Michael Steele, who last week unveiled his latest strategy for recruiting minority voters. “My plan is to say, ‘Y’all come!’ ” he explained, adding “I got the fried chicken and potato salad!”Among Sotomayor’s questioners, both Coburn and Lindsey Graham are class of ’94. They — along with Jeff Sessions, a former Alabama attorney general best known for his unsuccessful prosecutions of civil rights activists — set the Republicans’ tone last week. In one of his many cringe-inducing moments, Graham suggested to Sotomayor that she had “a temperament problem” and advised that “maybe these hearings are a time for self-reflection.” That’s the crux of the ’94 spirit, even more than its constant, whiny refrain of white victimization: Hold others to a standard that you would not think of enforcing on yourself or your peers. Self-reflection may be mandatory for Sotomayor, but it certainly isn’t for Graham. So what have we learned? 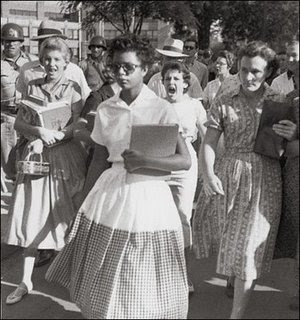 We have learned that maybe Lacewell-Harris is right when she compares Sonia Sotomayor to Little Rock Nine student, Elizabeth Eckford. Only now the mob is the composed of white, mostly southern, Republican Senators. We have learned that women, regardless of race, regardless of how successful they may be, still have to behave differently than men, that there is still a double standard. We have learned, again, that the Republican Party is mostly clueless when it comes to race. And I believe that their fear and dislike of Barack Obama will drive most of their behavior over the next eight years. GRAHAM: Now, during your time as an advocate, do you understand identity politics? What is identity politics? SOTOMAYOR: Politics based simply on a person’s characteristics, generally referred to either race or ethnicity or gender, religion. It is politics based on . . .
GRAHAM: Do you embrace identity politics personally? SOTOMAYOR: Personally, I don’t as a judge in any way embrace it with respect to judging. As a person, I do believe that certain groups have and should express their views on whatever social issues may be out there. But as I understand the word “identity politics,” it’s usually denigrated because it suggests that individuals are not considering what’s best for America. 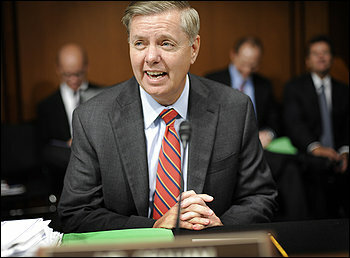 GRAHAM: Do you believe that your speeches properly read embrace identity politics? SOTOMAYOR: I think my speeches embrace the concept that I just described, which is, groups, you have interests that you should seek to promote, what you’re doing is important in helping the community develop, participate, participate in the process of your community, participate in the process of helping to change the conditions you live in. I don’t describe it as identity policies, because — politics — because it’s not that I’m advocating the groups do something illegal. GRAHAM: Well, Judge, to be honest with you, your record as a judge has not been radical by any means. It’s, to me, left of center. But your speeches are disturbing, particularly to — to conservatives. . . . Those speeches to me suggested gender and racial affiliations in a way that a lot of us wonder: Will you take that line of thinking to the Supreme Court in these cases of first precedent? The Republicans have spent most of their time over the last four days trying to figure out what makes Judge Sotomayor tick. I think the answer is pretty simple: Yes, she is a woman and yes, she is Latina and in her private time, she may volunteer for groups that advocate those causes. But when she is a judge, she is not an advocate. And that’s why none of you could find anything objectionable in any of her many decisions. Isn’t that what you said you want from a judge? Isn’t that why you were all upset about empathy? Sonia Sotomayor has shown that she has empathy and that she rules according to the facts and the law. I think that is what you said you wanted. Judge Sotomayor, confronted by Senator Sessions about how her take on a wise Latina’s decisions differed from that of Judge Miriam Cedarbaum, pointed out that Ms. Cedarbaum was her friend and was sitting in the audience. (In one of her speeches, Ms. Sotomayor had referred to Ms. Cedarbaum’s discussions about the number of women joining the bench and whether those numbers were having any impact.)Mr. Sessions repeatedly said he was “troubled” and very concerned as to whether she could be impartial if she couldn’t put her experiences aside. Ms. Sotomayor replied that she believed she did apply the facts to each case, and applied the law. We all see the world through our own lens. Sessions, whether he wants to admit it or not, see the world through his white, Southern, racist one. To expect any judge to lay aside his or her experience when looking at a case is to want robots or cyborgs to become judges. However, we do not want them to judge cases on emotion or experience alone, they must also apply the law. Sotomayor was saying that it was better to admit the existence of personal biases, and then control them with that knowledge. Sessions was forced to argue that a judge must come to the bench with no biases whatsoever─an ironic position indeed for a son of the segregated Deep South. He then went through a number of cases, including the litigation around the plane crash into Long Island Sound brought by the surving families. Even though she, along with everyone in the country, felt for the plaintiffs, she applied the relevant law and ruled against them. If he had uttered those words — that as a white man he would make a better decision, for example, against a minority opponent in a political race, “they would have my head,” Mr. Graham declared. Does that make sense? he asked. And then she went to to hope that we will move past this type of thinking and had Graham agreeing that if the hearing moved the discussion closer to this goal, it would have been worth while. 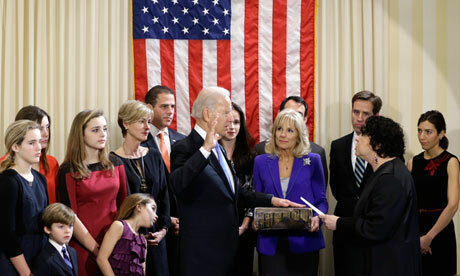 The discipline, preparation, canniness, record, and intellect of the nominee. The ambivalence, even confusion, of her GOP interlocutors (with the exception of the canny Lindsey Graham). The nature of confirmation hearings, which have become a form of predictable puppet theater, especially since everyone knows in advance that Sotomayor has the votes. Aside from her personal demeanor─calm, almost painfully explanatory─Sotomayor’s best weapon in the hearings has been her record as a judge. There just aren’t many cases that the GOP has been able to cite to make her sound like a wild-eyed “activist,” liberal or otherwise. So far, they have mentioned about 10 of her cases, out of hundreds. This Wasserman cartoon from the Boston Globe sums it up well.